Who is to blame for overeducation: graduates, employers or policy makers? It is not exceptional to read or hear from time to time in the media statements and comments about the current excess of graduates and how it is going to negatively affect the economy. The main claims are that if everyone is going for a higher education degree a non-negligible percentage of graduates will end up employed in positions for which they are overeducated (or underemployed). Even if that sounds like a current hot topic, concerns about graduates’ overeducation were first raised in the U.S. in the 1970’s. Given the dramatic educational expansion experienced since the end of World War II, it became clear that the pace of individuals’ educational upgrading surpassed that of occupations available. Obviously, this caught the attention and concerns of economists, policy makers, politicians and the younger cohorts who had to balance their educational investments. 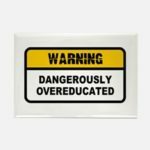 Generally speaking, the term ‘overeducation’ can be misleading. One could actually wonder if an individual can get too much education in his/her life. The upgrade in knowledge and skills brought by the educational expansion in most countries has been regarded as intrinsically good, not only promoting a knowledge society but also positive effects on economic, social, political and health life domains. However, the amount and type of education has been questioned from several perspectives: from an economic perspective declining economic returns to years of education is considered as a problem both, for individual’s and society’s investments. Individuals invest in a given amount of education based on the expected labour market returns, mainly, economic returns. From a sociological perspective it has been argued that overeducation can be understood as another form of social stratification, as it deprives education from its value as a mechanism for social mobility. Educational investments are not only based on the expected future earnings, but also on the expected social position, type of work and lifestyle. Educational expansion, especially at the tertiary educational level, is still taking place in most advanced economies. For the past 15 years, European countries have experienced a relevant increase in the percentage of young workers holding tertiary degrees (Figure 1 below). Concerns about the possible imbalance between supply and demand sides have regained importance given the lower pace of workers employed in high-skilled positions (ISCO1-2). Source: author’s elaboration, from Eurostat (2015). 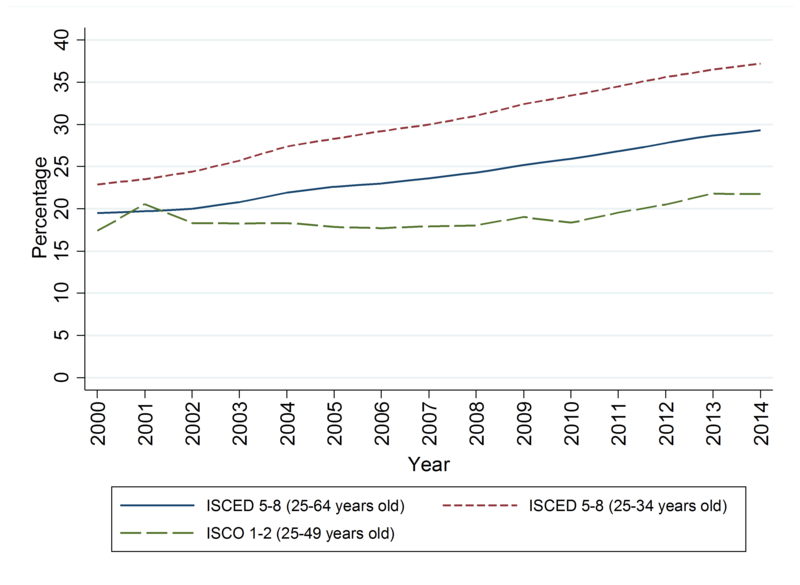 However, educational expansion does not necessarily translate into overeducation incidence. Countries not only differ in their supply of educated individuals, but also in the demand for highly educated workers. Larger shares of higher educated graduates entering the labour force might increase overeducation figures, but it has also been argued that skills supply and technical progress help to sustain the demand for high skills. Therefore, overeducation incidence does not only depend on higher educated graduates’ supply, but also on labour market demands. The educational attainment of employed individuals (Figure 2 below) and the share of workers employed in high and low skilled jobs by country (Figure 3 below) allow us to compare supply and demand sides across countries which differ in their skills strategy. Finland, Norway, Denmark and the U.S. combine above average figures of higher educated workers with a high share of individuals employed in high-skilled jobs. Similarly, Sweden and the Netherlands display close to average figures of higher educated workers with a large share of individuals employed in high-skilled jobs. It has been argued that this high-skilled strategy is possible when the welfare state takes an active role as an employer, although in the U.S. some argue that it is due to skills polarisation. 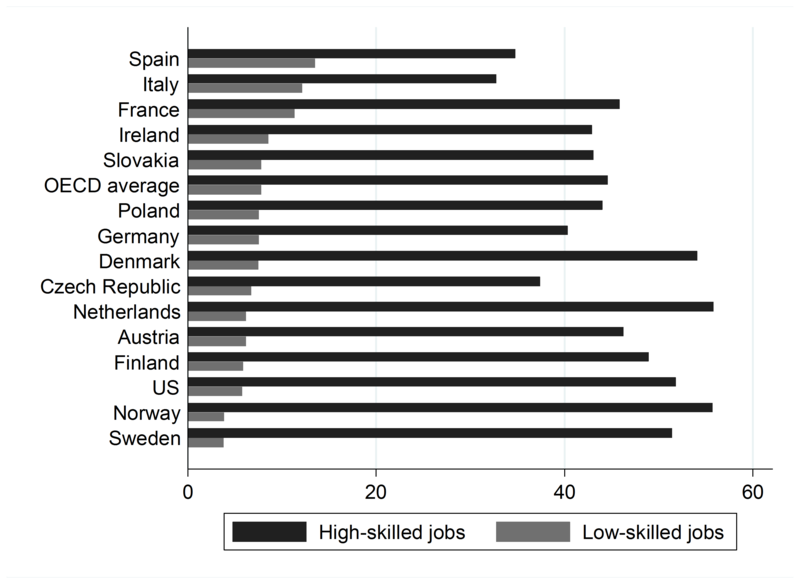 Other countries, such as Spain and Ireland, present above average figures in the percentage of higher educated workers, but their share of workers employed in high-skilled jobs is comparatively lower, which in turn facilitates overeducation occurrence. Conversely, the Czech Republic and Germany present below average percentages of higher educated workers with below average share of workers employed in high-skilled jobs, promoting skills match among medium skilled-level workers. Finally, Austria’s situation suggests an example of skills shortage: it displays below average figures on higher educated workers, but above average figures on workers employed in high-skilled jobs. 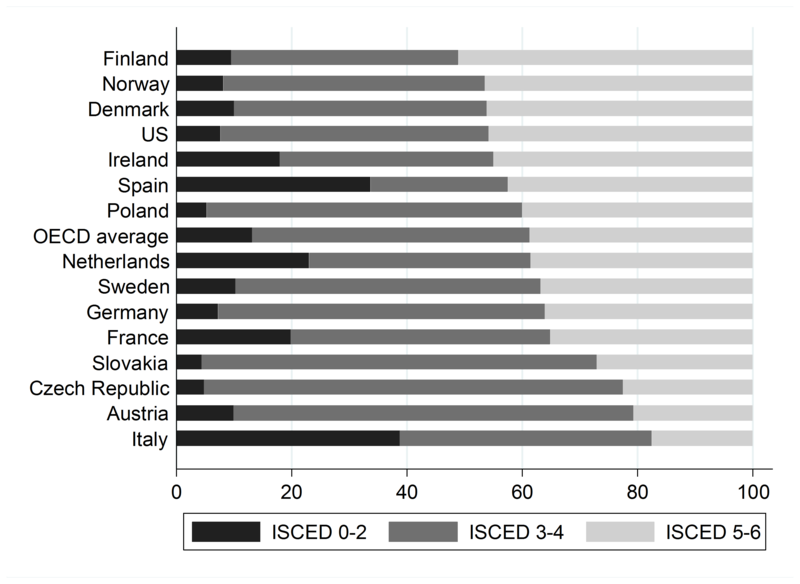 Note: Countries ordered in descending order by the percentage of employed workers with ISCED5/6. Source: author’s elaboration, from PIAAC (OECD). Note: Percentages do not add up to 100% because only high- and low-skilled jobs are shown. Countries ordered in descending order by percentage of workers employed in low-skilled jobs. High-skilled jobs include skilled professions at skill level 4 (ISCED 5-6 required), while low-skilled jobs include elementary occupations at skill level 1 (ISCED 1 required). Therefore, it seems that the ones to ‘blame’ are not only university graduates for attaining ‘too much’ education in relation to the requirements of the labour market. Public and private employers are also to be considered as part of the problem, and the potential solution. Increasing the capacity to provide public and private jobs to fully utilise the available knowledge and skills of the supply of persons willing to work would partly solve the existent mismatch in many countries. Finally, form a public policy perspective, some concerns are also to be addressed with regard to the value attributed to education and their potential uses. Beyond the economic returns to education there are non-monetary results worth stressing, such the positive externalities it has in terms of health, social engagement and political participation.